Belize City is the largest city in Belize, but is not the capital city. It was the capital of Belize until 1970, when the government was moved inland to Belmopan to make it more safe from hurricanes and floods. Belize City is still the financial hub of the nation and Belize’s main international airport is located 1.3 km northwest of the city. Even though Belize City is the largest city in Belize, it is still a small city by Central American standards. With a population of less than 61,000 (2015 estimate) it often feels more like a big town than a major city. Belize City sits right on the Caribbean coast, at the mouth of the Haulover Creek, and a large part of Belize City is less than 5 meters above sea level. All this makes it vulnerable to hurricanes and flooding, and the city was nearly destroyed by Hurricane Hattie in 1961. 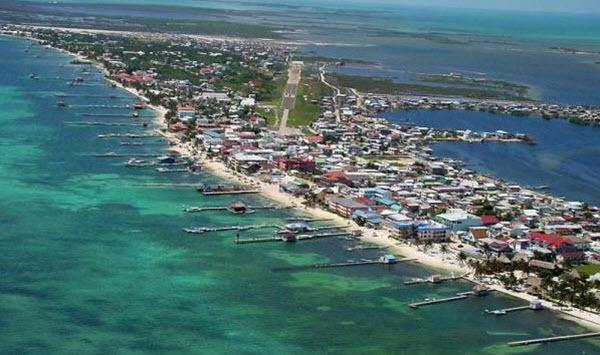 Belize City is located on on a small peninsula that was once home to a small Maya city named Holzuz. In the 1630s, British lumber harvesters took advantage of this ideal location to create a port town. The above mentioned Haulover Creek is a tributary of the large Belize River, and the Belize River itself empties into the ocean 8 km from the city. The old prison on the corner of Queen Street and Gabourel Lane has been converted into a museum filled with exhibits focusing on the history of Belize; from the Mayan civilization and onwards to the colonial era and independence. You can for instance see the earliest (1837) stamp of Belize depicting Queen Victoria here, as well as the Buenavista Vase depicting the mythical Maya Hero Twins dancing in victory over the Lords of Xibalba. The building was used as a prison from 1857 to 2002 and one of the jail cells have been preserved and is open to visitors. St John’s Cathedral is an Anglican cathedral build between 1812 and 1820 using bricks from ship ballast. Next to it is Yarborough Cemetery, the oldest Anglican cemetery in Belize, used from 1787 to 1896. In 2009, the cemetery was designated an archaeological reserve. St John’s Cathedral is found between Albert and Regent Street in southern downtown. Eco-Museum Belize is a living museum dedicated to displaying the beauty of nature and how nature can be protected. You will find the Eco-Museum at the 14.5 Mile mark on the Western Highway. There is one brewery in Belize, and in addition to brewing, they also run the Riverside Tavern in Belize City. A great spot for Belize-made draft beer. Closed on Mondays. From Belize City, water taxis and ferries deport for small islands such as Caye Caulker and Ambergris Caye. Ambergris Caye is the largest of the several hundred islands and islets located in the northernmost waters of Belize. Caye Caulker is a roughly 8.2 km long island located near Belize City, about 1.6 km west of the Barrier Reef. The trip from Brown Sugar Terminal in Belize City to Caye Caulker usually take around half an hour with a water taxi, while you will spend about 1 hour and 15 minutes going to Ambergris Caye. Two examples of available water taxi companies in Belize City are San Pedro Water Taxi, San Pedro Belize Express Water Taxi and Tunderbolt Water Taxi. Many of the taxi companies also run between Ambergris and Caulker, so you don’t have to go back into Belize City to get from one island to the other. Tips! Some of the water taxis can also take you from Belize to Mexico and vice versa. An alternative to water taxi is to take the ferry Ocean Ferry Belize. It goes from Belize City to Caye Chapel, Caye Caulker and Ambergris (San Pedro) and transports both passengers, cargo and animals. In Belize City, the ferry departs from the Swing Bridge. The Philip S. W. Goldson International Airport (IATA: BZE, ICAO: MZBZ) is the nation’s main international airport. It’s located in the village Ladyville, approximately 1.3 km northwest of Belize City. A taxi ride from the centre of Belize City to the airport takes roughly half an hour. The airport is serviced by several large airlines (including Delta, Southwest, United, and American Airlines) as well as regional carriers such as Tropic, Maya Island Air, Avianca El Salvador, and Copa. Autobuses del Norte (ADN) and Fuente del Norte are two examples of long-distance bus companies that transport people from Guatemala City to Belize City. Expect 10-12 hours travelling time. Both standard buses and more high-quality buses are available. There are no functioning railways in Belize anymore. The Port of Belize is the largest port in the country. Most large cruise ships will not use the Port of Belize since the water is too shallow. Instead, they will dock 4 miles southeast of Belize City, where the water is deeper. Tender boats will then transport cruise passengers to the pier at the Tourism Village near Fort Street. Big Creek Port in the Stann Creek District is primarily used by banana exporters, oil companies and container ships. Commerce Bight Port is primarily used by citrus exporters.